Peking Chinese Restaurant, Kansas City's Neighborhood Chinese Restaurant! After trying Peking, I rarely bother with other chinese restaurants now. The food is fresh, inspired, reasonable and the decor fun. Have yet to try every thing on the menu. The food is not heavy, while being just as flavorful. Wish I lived closer so I could get a take-out order of hot-and-sour soup whenever the mood struck me. This is a GREAT neighborhood restaurant! Thank You TK J from KCPeking.com, for your testimony. I live in Hollywood, Los Angeles, CA; the epitome of Chinese food in America. I came to Kansas for a filming and I had a craving for delicious Chinese food. I searched up from citysearch and realize there was this great Chinese restaurant. The reviews under city search are 150% correct. 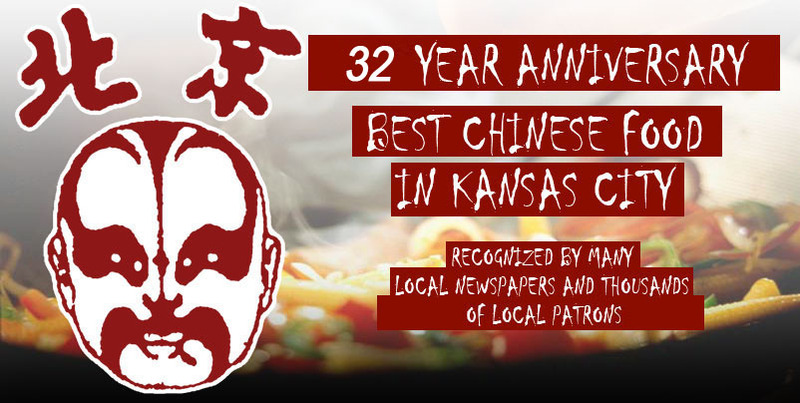 For the last five months I have been recommending my friends to come to this Chinese restaurant when they come to Kansas for business. I can rave on and on about the Chinese food but the most important part. You have to try it! My Chinese food palette is ridiculously picky and this restaurant fulfilled my needs. Thank You mradventure from KCPeking.com, for your testimony.